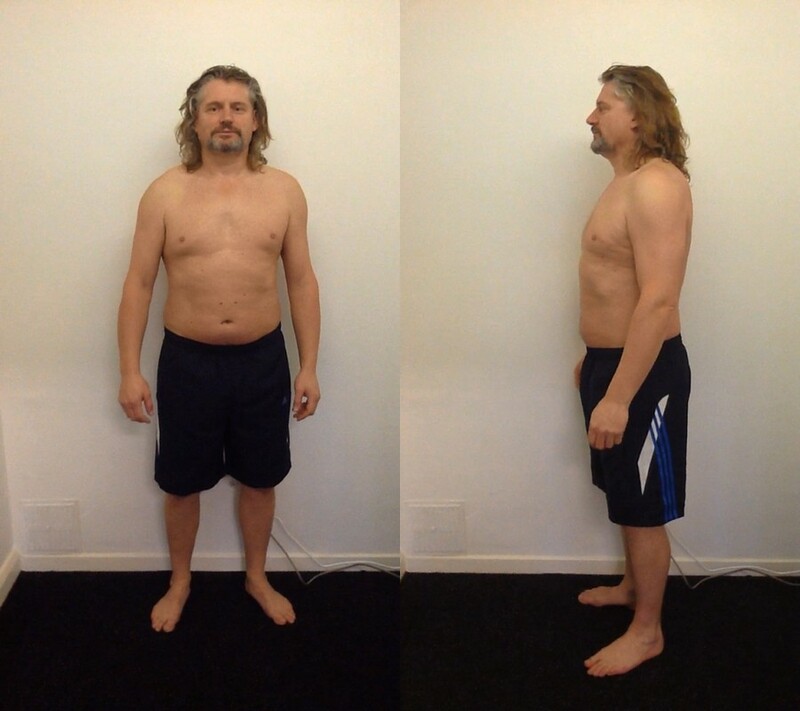 James wanted to get strong and toned and achieve a weight of about 95kg. We set this as his target. Taking measurements and photographs to benchmark James’s starting point. Benchmarking his daily calorie expenditure. Setting a goal. James wanted to get to around 95kg. Setting an initial level for his calorie intake. We cut calories and assumed a calorie burn from exercise. Providing coaching on food intake. This included food theory and diet construction. 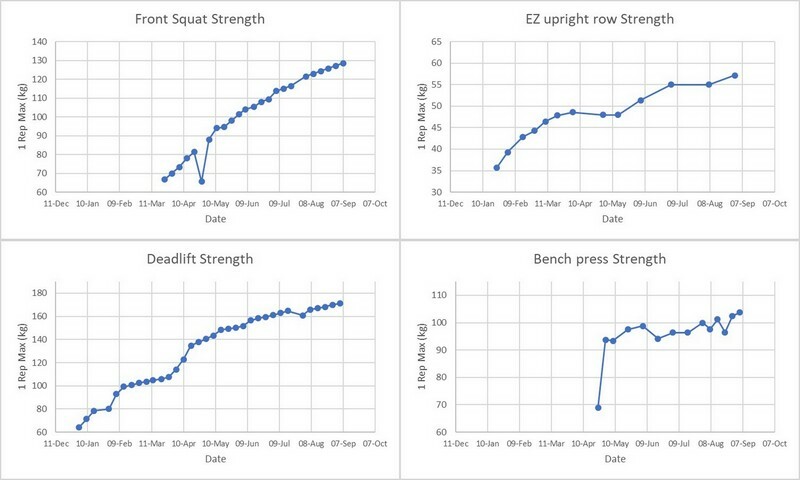 Constructing an exercise programme consisting of weight training and cardiovascular exercise. James was totally focused for his workouts. Preparation, execution and post-workout were all nailed. Strengthen his heart, lungs and vascular system. Improve his ability to burn fat as a fuel. Improve his health markers and resting heart rate. Enable him to build muscle whilst losing weight. Provide a metabolic and hormonal cascade of beneficial effects. Build a balanced muscular physique and improved V-taper. 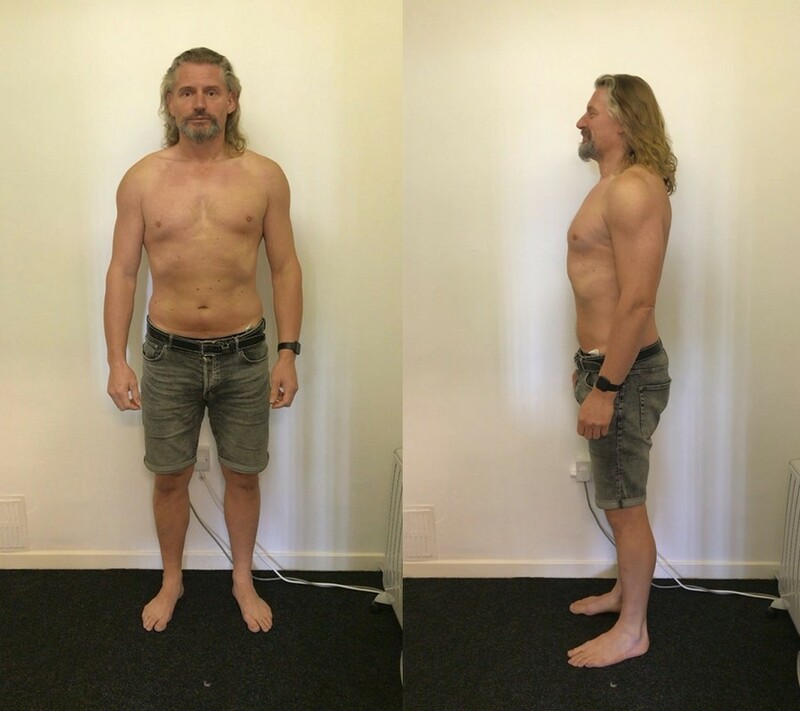 James lost 9kg in 8 months. He lost 24lbs of fat and gained over 2lbs of muscle. That’s a lot for a 50 year old man! His body fat % improved from 32.6% to 25.6% and his % muscle from 38% to 41.7%. James’s health markers improved considerably. His blood pressure went from 142/97 to 116/71. His waist to hip ratio improved from 0.96 (overweight) to 0.88 (normal). James’s strength gains were relentless. Week after week James hit new PBs in all the big lifts. Here are some of James’s lifts. Deadlift: 3 sets of 6 at 145.5kg. Front Squat: 3 sets of 10 at 90kg. Bench press: 8 reps at 83kg. Skullcrusher: 10 reps at 36kg. EZ upright row: 12 reps at 40kg. James’ approach to lifting is verging on professional! He has a consistent and structured preparation, with rolling, mobilisation and warm-up, along with his pre-workout cocktail. In the sessions his focus and determination are supreme. The strength and physique gains speak for themselves. After an initial fat loss as expected, James hit a fat-loss plateau. We have since traced this back to sub-optimal food choices and portion sizes. Now that James has corrected some of these diet anomalies, he is back on track with fat loss early in his second stint with Life Force Fitness.